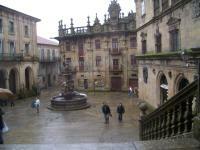 If you wish to tour Santiago de Compostela, we recommend you to visit Plaza da Inmaculada, a place where you will find part of the charm Santiago de Compostela hides. You can enjoy a wide range of leisure, art and cultural offers. Moreover, in the vicinities of Pensión Santa Rita you will also find many other essential places of interest if you want to know in deep Santiago de Compostela. These are some of the places of touristic interest of leisure, culture that you can visit during your holidays in the locality of Santiago de Compostela.